Often described as the Oriental version of Chess, Go is the national game of Japan, where it's known as "I-go". It is believed to have originated in China (where its name is "Wei-ch'i") thousands of years ago. 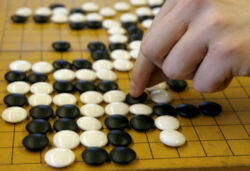 Go is considered to be one of the world's foremost games of strategy and skill. It is a two-player game played on a grid of 19 horizontal and vertical lines. Unlike games such as Chess and Checkers, it is played not on the holes between the lines, but on the intersections of the lines – 361 of them. The intersections of the 4th, 10th, and 16th lines in each direction are called "handicap points", and are marked with dots. Each player receives a supply of black or white stones, with which the game is played. Black goes first, and places a stone on any interection of the lines (known as "points"). The players alternate turns, each placing a stone on an empty point, with the aim of capturing territory by surrounding opponents stones. Go is also known by a number of other names, including Baduk, WeiQi, TsumeGo, Paduk, and more.